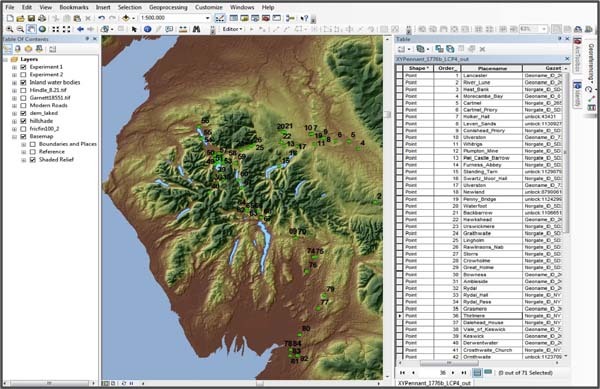 GIS is a type of database-management application that allows the user to identify, map and analyse the geographic information contained in a set of data or statistics. Broadly speaking, geographic information consists of two components: a spatial component, such as a place-name or a location, and a thematic component, which assigns some attribute to that place-name or location. Think, for instance, of a census, which is essentially a dataset comprising thematic descriptions (demographic descriptions, economic descriptions, etc.) that are organised in terms of discrete spatial units (such as parishes, towns and boroughs). A GIS application is a tool for bringing these different strands of information—the spatial and the thematic—together and for examining correlations between them. From a technical perspective, this process involves geo-referencing the dataset, or using a gazetteer to assign each piece of spatial information a set of coordinates. Once geo-referenced, the dataset can then be mapped, displayed and analysed in different thematic layers or groupings. The use of GIS applications has helped researchers to challenge existing orthodoxies, re-examine traditional questions and, in some cases, ask entirely new questions. This has led to major advances in fields as diverse as environmental history, historical demography, and economic , urban and medieval history. The strengths and limitations of the current state of GIS-aided research can be illustrated by Ian Gregory’s “Different places, different stories: Infant mortality decline in England & Wales, 1851-1911” (2008), which used GIS to examine declining infant mortality rates in England & Wales between 1851 and 1911. At the national level infant mortality rates began to fall during this period, something which historians have conventionally attributed to the implementation of new public health legislation during the Victorian period. Re-examining this topic with a GIS afforded a number of unique advantages, not least the ability to integrate complete runs of vital registration data for 635 districts and, therefore, to produce far more comprehensive and localised models for studying infant mortality in the latter 19c. Creating these models enabled Gregory to show that in rural parts of southern and eastern England the decline in infant mortality started long before the implementation of public health legislation and led to far larger proportional improvements than occurred in urban areas. At the same time in rural parts of northern and western England, and much of Wales, infant mortality rates barely improved over this period. These findings challenge the orthodoxy that infant mortality decline was driven by public health legislation. If the decline in infant mortality was caused by such legislation, then why were parts of England declining long before legislation was introduced? Why, moreover, was it that rural areas showed the biggest improvements when the legislation was aimed primarily at urban problems? Furthermore, why did some other rural parts of England fail to improve? In short, did government intervention really make any impact on infant mortality decline or were completely different factors responsible? This points up a limitation of GIS-based research: namely, that although it assists the researcher in posing questions, it is unable to answer them. Using GIS helps show us that in addition to understanding the story of infant mortality decline at national level and in the cities, we also need to understand the story of the decline in the rural south-east and why this differed from the rural north and west; but, for all that, it does not enable us to tell these stories in any detail. In other words, although GIS-based analysis is an excellent tool for asking what happened, when and where, it has very little ability to explain why–which is something that the researcher must examine by returning to his/her sources. Like a good map, a GIS is an exploratory tool that helps generate questions and guide research.